Dozens of cruise ships berth in Rotterdam every year. 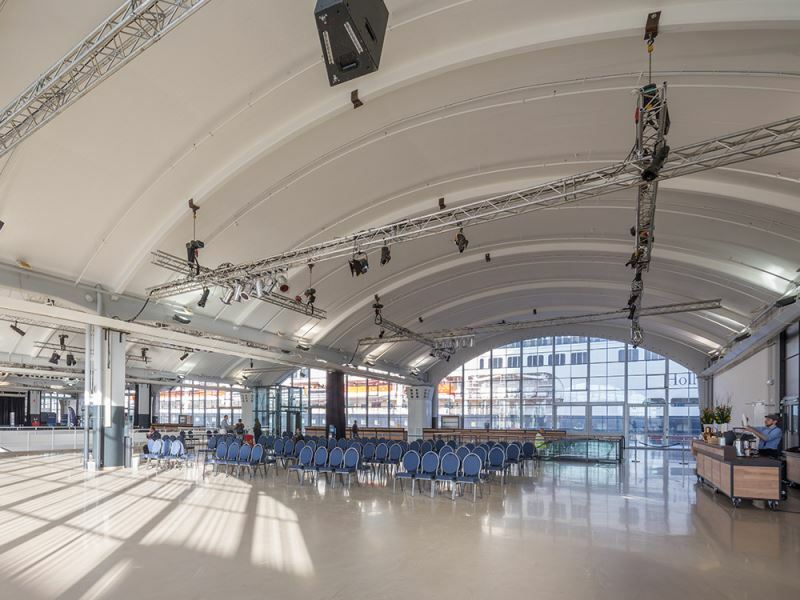 Passengers disembark in the Rotterdam Cruise Terminal, an industrial heritage structure with an iconic silhouette. The number of visiting cruise ships is expected to double by 2018. The ships are moreover constantly increasing in size. This necessitated expansion of the terminal. The area for baggage handling in particular has become too small. A total surface area of 1,000 m2 is needed to handle all the suitcases. This has to date been done under a tent on the quay. The aim was to come up with a solution to providing adequate baggage space, while allowing the tent to be done away with. 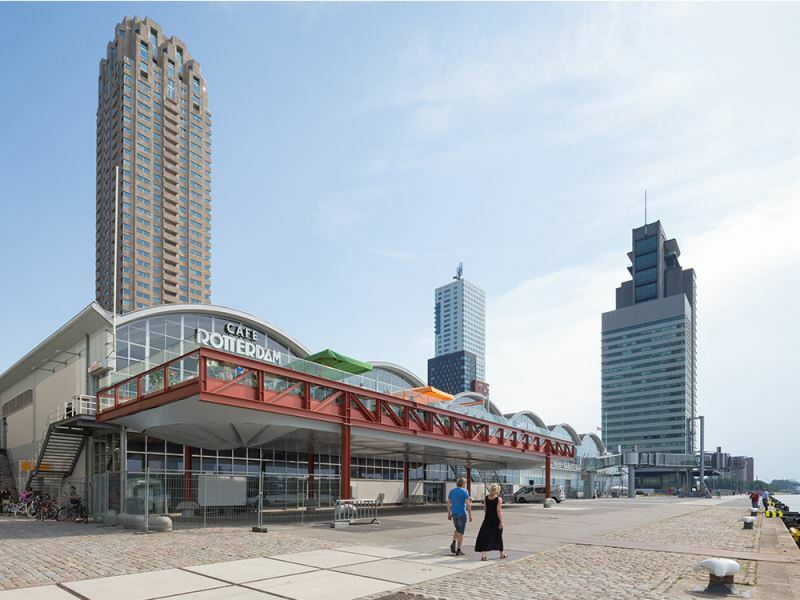 An area of 700 m2 could be gained within the building by modest renovation and by moving the well-known Café Rotterdam to the first floor. The additional 300 m2 still needed were found by constructing a steel structure in front of the terminal. This incorporates a smart detail: the space under the structure can be cordoned off with oilcloth and laid out as baggage area. When there are no cruise ships in the port, the oilcloth can be winched up to the ceiling. Café Rotterdam gains a terrace on top of this structure, five metres above ground level and with a majestic view over the River Maas, the Erasmus Bridge and the Rotterdam skyline. Meanwhile, a new gangway that will be installed in the summer has been ordered from Spain. This gangway is able to service the world's largest cruise ships with its connecting height of 12 metres above the quay. 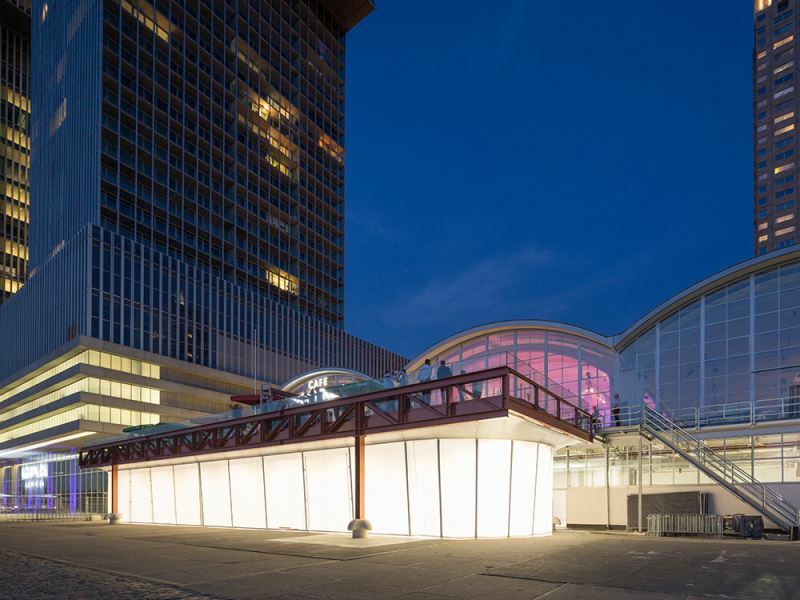 As part of the same project, refurbishment of the entire building shell was undertaken on behalf of the owners, the City of Rotterdam. A new insulated roof has been installed. The exterior walls were stripped and repairs to the concrete carried out. The authentic narrow steel façade profiles were restored to their original condition or replaced by new profiles fitted with insulated refurbishment glazing. On the basis of its knowledge of façade building in the Netherlands, ABT was involved in the selection of the façade builder, a specialist with experience in the refurbishment of façade walls and authentic detailing from the 1940s. In addition, ABT is solely responsible for engineering the entire project. ABT is also conducting the design management. The contract extends from commencement to aftercare.